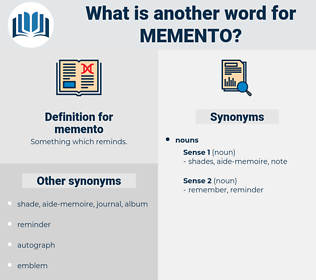 What is another word for memento? recollection, keepsake, commemoration, commemorative, commemorating, remembrance. The life of every one is a standing memento of its truth. I wished also for a memento from his room, something the more valuable to me because valueless to others, and I found his ivory cane to take and his leather book, the same being a treatise on fishing by a certain Isaac Walton, who, if he tells the truth, knew little about the habits of trout and salmon, and did write much foolishness in a pretty manner. 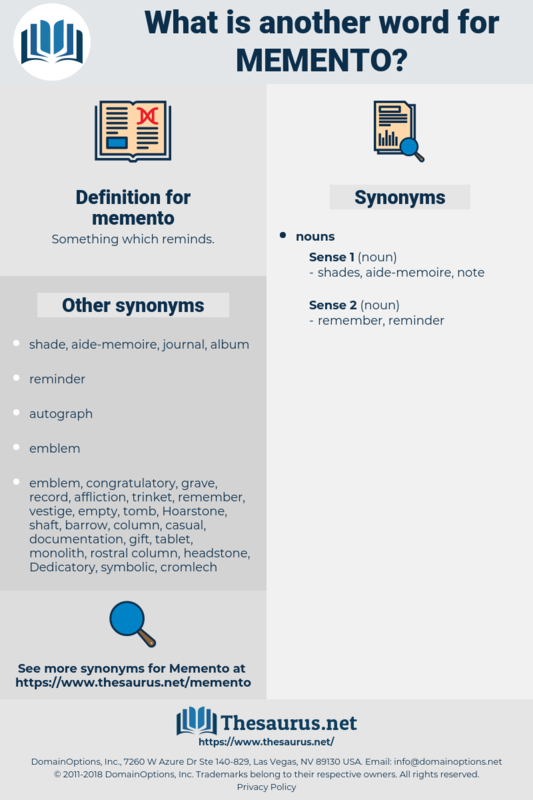 mate, moated, mammoth, mode, maidhood, maundy, math, mod, md, monday, mantidae, mediety, mayweed, mammutidae, momotidae, manumit, manta, minuit, madia, manda, matt, maimed, matai, mad, mouth, mood, mid, man-made, minuend, moiety, matted, monad, Mutawa, monody, maid, meed, mut, may day, mt, munda, mind, moneyed, mined, mahound, mountie, manet, manhood, myoid, minnewit, meade, muddied, mat, med, monte, monnet, maidu, maenad, muhammad, mohammed, meditate, manteodea, moment, mediate, monet, mott, midi, mute, mount, manned, Mete, manatee, MDI, made, mantid, mutt, minute, monod, moth, mot, meet, mantua, mead, midway, mound, montia, muddy, minded, mite, manidae, miniate, mud, mammut, meted out, Mahdi, Mothy, monument, month, minutia, mint, mimidae, mande, motet, method, meat, mennonite, manhunt, mend, muted, monied, mediated, mated, moot, metadata, manihot, mote, manteidae, middy, mutate, matte, matthew, matey, minuet, mete out, maund, mahout, mounted, manat, moat, midday, momot, mitt, medea, meth, mayday, mamet, motto, meaty, mit, meadow, menotti, myth, mentha, mahomet, mandate, Mohammad, moody.